How can I view roster trends? Once you login to the RosterElf smartphone app for iOS or Android, the first section in the Dashboard menu is "Trends". We all know that part of running a successful business is managing costs, especially labour costs, and this Trends section is designed to help. 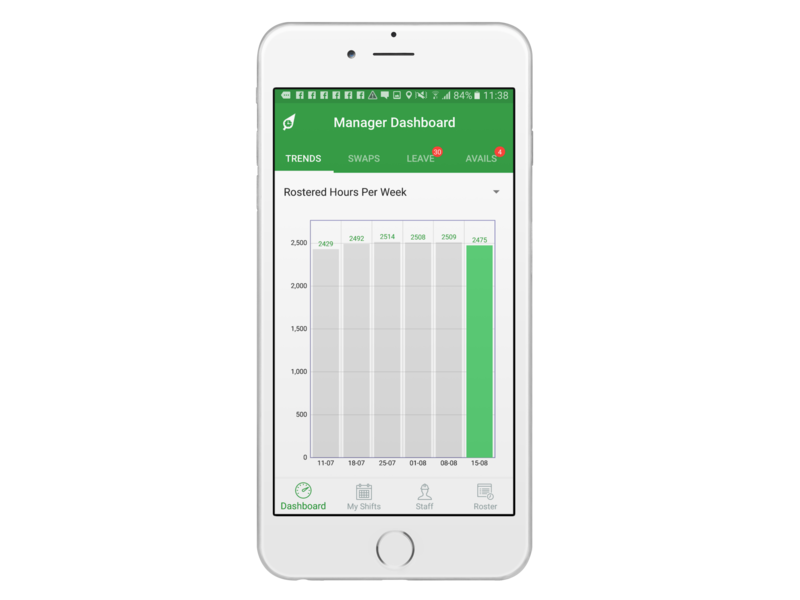 The Trends section of the app shows a simple graph with data on rostered hours, average pay-rate and labour cost over the last 6 weeks. The core aim is to help managers get a helicopter view of labour related costs so they can tweak and adjust weekly to stay in budget. The first filter available on the roster trends report on the app is "Rostered Hours Per Week". This view displays an overview of the total hours rostered across all sites over the last six weeks. The green bar indicates the current week so you know exacting how things are tracking. The second filter available on the roster trends report on the app is "Average Pay Rate Per Week". This report gives managers a snap shot of the average hourly cost of employees rostered week by week, across all sites. If you notice that your average payrate is climbing, it could be a good time to hire some more junior employees or carefully review future rosters to ensure the right mix of staff are rostered on to work. The third and filter filter option on this Trends section displays a graph of the "Estimated Labour Cost per Week" over the last 6 weeks. This statistic is based on pay rate and award interpretation data added into your RosterElf account so the more accurate your pay rate information is, the more powerful and useful this view will be.